Proper winter preparation for your home can save you thousands in costly repairs and utility bills. Regardless of whether you’re located in an area that brings snowy and frigid weather or just cold and moist days, winter months drive many to spend extra time relaxing in their houses. With all this extra time indoors you’ll want to make sure you and your home have been properly winterproofed. One quick tip is simply adjusting your thermostat, by slightly moving the temperature down a couple of degrees each week will help you acclimate to the cooler weather. Additionally it will also help save money. Keep adjusting the thermostat down until you reach a temperature that is comfortable. You can also help regulate the interior temperature by proper sealing of windows and doors. Many online vendors like Amazon.com sell draft stoppers to help manage interior and exterior drafts. Think you’re the only one cold this winter season? Think again… make sure you seal all exterior areas of the house that might be inviting for pests. With the cooling climate it’s important to know that even the smallest of critters will seek warm shelter during the cooler months. One sure way to help in this task is to place firewood no closer than 20 feet from the house. Firewood piles is a great place for pests to gather and if it’s close to your home you might be inviting some unwanted pets. It goes without saying that with the winter months come warm, cozy fires and along with proper storing of the firewood it’s important to do proper maintenance on your chimney and vents. Blockages in a chimney can be very dangerous and in extreme cases even fatal. Make sure to have your chimney cleaned each year so the fumes associated with the fire escape through the chimney properly. In extreme freezing weather you’ll want to entertain winterizing your plumbing pipes. Old steel pipes without insulation or heat stripping our conducive of cold and can freeze and then burst fairly easy at climates below 32 degrees. If your pipes are steel then insulate them properly by wrapping heat stripping around the pipes and then covering the heat stripping with pipe insulation foam. Another option is to upgrade your plumbing to pex which is a high pressure plastic pipe system that will help with pipes breaking. 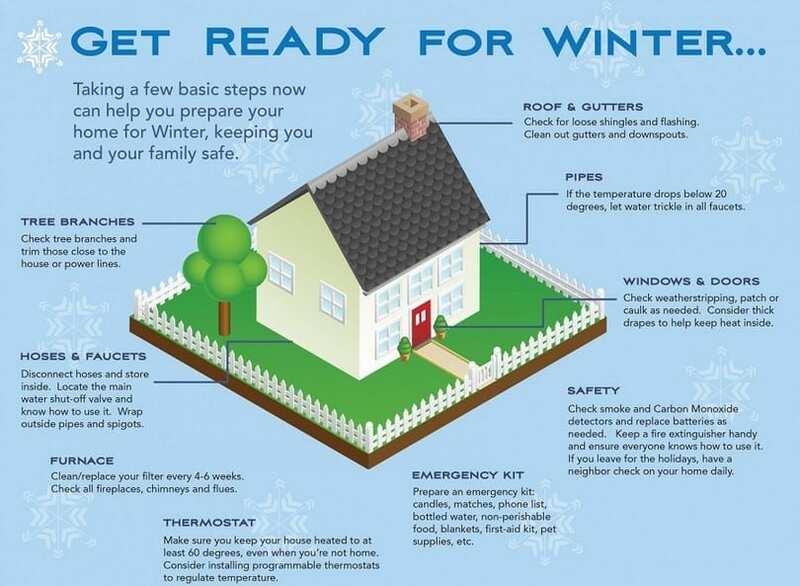 For more information on proper winter preparation, please contact us or leave a comment below. We’d appreciate the opportunity to assist you.